It began with the desire to be a part of something meaningful and to leave a legacy for our children. So, in 2002, after an extensive search, we purchased the farm and our journey began. Our goal was/is to be sustainable and provide our family with a healthier way of life and better food. We decided to raise "Heritage Breeds" with Devon cattle being our first choice. Our farm needed a lot of TLC when we purchased it, so the first years were spent in renovating and reclaiming pastures, building and repairing fences, clearing brush and working on the farmhouse. (It's a work in progress!) We purchased our first animals in the fall of 2006 and finally moved to the farm full-time in the summer of 2007. We now have 74 Devons, 48 "old-style" Hereford, 25 Red Angus, 26 Jerseys and quite a few Devon/Angus cross heifers and steers. We also have a few Large Black Hogs, 70 chickens, a couple of Anatolian Shepherd guard dogs, an English Bulldog, a German Shepherd, a house cat and a barn cat. We feel truly blessed to be here in this place and plan to be here for many years to come! Our farm is located in South/Central Arkansas about 78 miles south of Ft. Smith on East Hwy. 28. We are in a valley on the Fourche River surrounded by the Ouachita National Forest and the Ouachita Mountains. This is a family-run farm with all members participating. Greg and Lavonne manage the cattle side of the operation. Erin (18), Ellie (18), and Emma (15) are our three daughters. Ellie and Erin no longer live at home but work when they visit. Emma helps out with the pigs, chickens, and she has three horses. She also milks the Jerseys when they calve. God has brought us to this place and we are truly blessed to be able to be here working together toward a shared goal that he has placed in our hearts. The Devon breed has been around for centuries. They are believed to be descendants of the aborginal cattle of Britain and were first brought to America by the Pilgrims in 1623. They were selected as a dual-purpose breed used as oxen and for milk and meat. They are known for their high fertility, calving ease, docility, hardiness and ability to adapt to temperature extremes. They are active, good walkers and excellent grazers. In England they are known as "The Beef Breed Supreme at Grass" due to their easy fleshing ability on grass alone. It has been said that there is no point in crossing the Devon because there is no other breed that can offer anything to improve them. Devons are very docile and easy to work with which makes them a great addition to the family farm. They are excellent mothers and calve without assistance. Their milk has a high butter-fat content which allows them to raise beautiful, healthy calves. They are extremely well-adapted to rough grazing, even in poorer type soils and have the ability to put on fat even in these conditions. Although, they do not typically attain the high weights of our common beef breeds and tend to grow more slowly, it is this more natural growth pace that allows them to put on fat reserves, both under the skin and within the muscle, that leads to close-grained, well-marbled beef. We are able to produce a consistent, repeatable product by using prepotent, line bred Rotokawa bulls. This pure, genetically-dense line of cattle originated in New Zealand from a herd that has remained closed for 70 years. This genetic density allows the bulls to "stamp" their offspring and create quality calves every time. Our Hereford cattle are from a herd in Mexico that has had no outside genetics brought in for 43 years. They have the "old-style" body type (short and wide); exactly the body style needed in a grass-based system. (They are very similiar to the type of Herefords that were prominent in the 1950s.) Their genetic traits have been selected over the years for hardiness and an ability to thrive on grass, and not much of it. The ranch in Mexico, Valle Columbia, where they were born is high desert country and has very little grass yet the cows there are all very healthy and fat. They are used to working for their food and walking for miles to get to water. 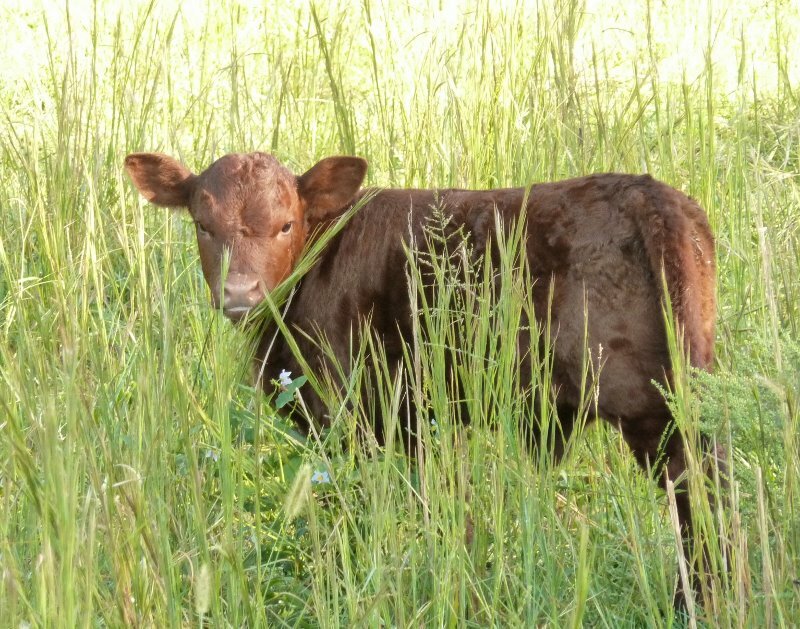 When we brought our heifers & bulls from there to Arkansas, they showed almost no signs of adaptation problems. What little weight loss they had during transport was quickly regained and more. They came from a "range" type system to our much more "hands-on" management style, but have adapted well to that also. We are very excited about the possibility of re-creating the type of Hereford cattle that were so popular in times past and hope, in some way, to help the breed regain some of that popularity in the future! We had our first calves out of these heifers last spring and are very pleased with the results. They all calved out without assistance and are very good mothers! When we were looking for a family milk cow, we quickly realized that she was going to be very difficult to find. First off, most dairy calves are weaned extremely early, if they're even allowed to nurse at all. Because of this, the replacement heifers are just poor doers. They didn't get what they needed when they were young and you have to prop them up. We learned this lesson the hard way through a series of heat-breaking goodbyes. So, when we were told about a grassfed dairy that was relocating and needing to sell, we jumped at the chance. These Jersey cows were grassfed only, out on a large pasture and the calves were kept on the moms until they (the momma cows) decided to wean them. They came into the barn when called for milking time and stood there without being fed or tied while being milked! According to the Oklahoma State University Animal Science Dept. cattle breed directory, "the Jersey breed originated on the island of Jersey, a small British island off the coast of France. It is one of the oldest dairy breeds, reportedly being purebred for nearly six centuries. Jerseys were known in England as early as 1771 and were regarded favorably for their milk and butterfat production. They were brought to the United States in the 1850's." Why Devon? Watch the video below to learn more.